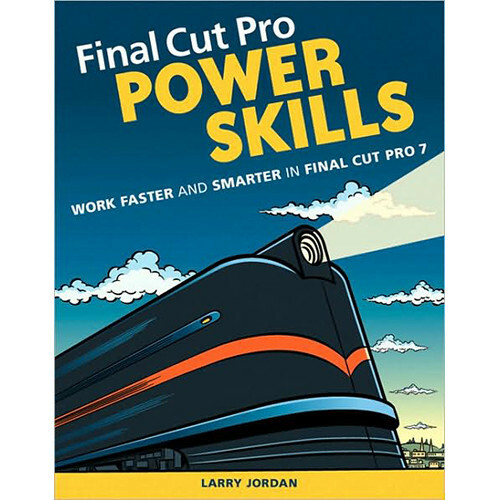 Final Cut Pro Power Skills - Once you are familiar with the program, you'll want to go faster and and more efficiently. This book gives you tips and techniques as well as some terrific shortcuts to help you get through Final Cut Pro. There are seven additional features in this program and this book will give them all to you in easy to understand language. From ProRes formats, iChat, Alpha Transitions and more, you'll learn how to perform more professional and high-quality editing in a wide variety of work environments. About the Author: Larry Jordan is an Apple Certified Trainer in Digital Media with more than 30 years' experience as a television producer, director, and editor with national broadcast and corporate credits. Based in Los Angeles, he's a member of both the Directors Guild of America and the Producers Guild of America. Recognized as one of the Top 100 Corporate Producers in America, he has also written three books on Final Cut Studio for Peachpit Press and is the executive producer and host of Digital Production BuZZ.